I discovered this wonderful tiny VFD clock by chance, while browsing Tindie for novelties. As I’m a newcomer to this Nixie/VFD world, I was not aware that Brian Stuckey already did an article in 2014 on a previous incarnation of this clock (Akafugu Modular VFD Clock). I contacted Per Johan Groland, owner of the Japanese maker Akafugu that makes these clocks, for all the shields I could get my hands on - The only shield I did not order was the 4 tube IN-4/17 shield, which Brian already tested and which I find does not do this clock justice. The VFD Modular clock arrived as a kit. Shipping from Japan to Switzerland took less than two weeks. All the parts are well packed, each in its own bag. The PCBs have a glossy black solder mask with golden ENIG finish. A USB cable is also included. The main PCB is protected in its own bag. You can order the tubes from Akafugu. If you have already ordered tubes from elsewhere, like eBay, it’s also possible to order the clock without tubes. This clock can be ordered in Akafugu’s own shop, Tindie or eBay. For custom orders, like ordering several or only specific shields, it’s preferable to contact Akafugu via email. It’s also possible to order acrylic cases. Per also shipped the 6 tube IV-4/17, the IV-18, the IV-22 and the IV-6 shields. I did not order a case, as I intend in the future to make my own. At the risk of repeating some of what Brian already said, I'll perform a full review of all the shields except the one that was already reviewed. It's important that this review be self contained and that you don't have to make reference to previous articles. The clock has two parts - the clock base board and the tube shields. The base board size is just 100x35mm big. It uses 10mm nylon spacers so the PCB does not sit directly on the surface. On both left and right sides of the board there are two pin headers - this is where the shields will connect to. There are two buttons, confusingly labelled S1 and S2, where S1 is “Button 2” and S2 is “Button 1” on the back side of the PCB. There’s also a two-position switch that enables or disables the alarm. This is an interesting point - where one can control the alarm with a switch instead of entering menus to enable/disable it. This is a lot quicker and easier than fiddling around in menus, especially if you are sleepy. On shields that support dots, the alarm enabled indicator is shown as the rightmost dot or a big dot (IV-18 shield). Also on the backside there’s a USB mini connector - you can use this connector to power the clock, as well to program it. On the front of the board there are two LEDs - one blinks when your power-on the board - and the other blinks when the board is being programmed. There’s additionally a SMT switch that resets the clock. Underneath the clock there’s a row of pins compatible with Adafruit’s GPS module. Any GPS or GPS emulator, like nwts, should work with this clock, if connecting at TTL levels and if supporting 4800 or 9600 bps. The clock uses the $GPRMC NMEA string to get its time. It will synchronize the time every 1 minute. The clock supplies 5V to power the GPS module. There’s also a description of an I²C temperature/humidity sensor on the clock’s schematics, but this is not included in the board. Currently the clock derives its temperature from the RTC chip – but as the clock warms up a bit, this temperature is always a few degrees higher. Measuring with a laser temperature sensor, the temperature reported matches the RTC surface temperature. The ATmega is preloaded with an Arduino Leonardo bootloader – this allows programing the open source firmware using just a USB cable and the Arduino IDE. Also included are ICSP pads on the underside of the board, but these require a pogo-pin adapter to be able to use them. This probably the clock’s greatest strength: it’s completely open source. The current firmware code is published on GitHub. Finally, there’s a 3.3V CR1220 battery holder to allow the RTC to maintain the current time in case the clock gets disconnected from power. A really nice touch is that the clock detects what shield is connected by a 3-bit pattern and adapts itself to show the correct display for the different tubes, there is no need to set any thing up for the different shields. Every shield has a hole for each tube, with grooves for each tube’s wire contacts. Before soldering the tube, extending the wires outward and placing them in the grooves, allows for an easy alignment and soldering. It also makes it possible to replace a tube easily. The IV-22 shield uses expensive Harwin tube sockets, the same as used in other clock models from other manufacturers - this allows an even easier replacement of the tubes. The IV-6 and IV-22 tube shields are very similar on their display capabilities - the only difference being the size and orientation. The clock operates very similar with these tubes. The IV-18 shield has two additional digits, making use the two additional digits for longer scroll and FLW animations. Also uses the big dot on those tubes as an alarm indicator. The IV-4/IV-17 shields use the tube’s sixteen-segment display to display real letters; on the seven segment tubes, we can only guess what letter is shown, on the sixteen-segment tubes this works out very well. However, due to the additional segments, disappointingly, this module does not have any dots. All the shields except the IV-18 have additional I2C pins that allow future expansion! Starting the clock for the first time, the Load LED will pulse for about 8 seconds, after that the display will show which shield is loaded. The clock will then display the time/date/temperature/four letter words/message on the display, depending on the configured parameters. The menu system is simple and efficient, but takes some time to get used to. Button 1 advances to the next menu item. Button 2 changes that item value. If a menu item ends with a dash, this means there’s a sub-menu. Pressing Button 2 enters that sub-menu and again Button 1 moves to the next item and Button 2 changes that menu value. It can take some time to get used to it, or to try to decipher the characters on the seven-segment displays. Toggling the alarm switch enables or disables the alarm. On all shields except the IV-4/IV-17shields there’s a dot that indicates the alarm is on. The clock supports 12/24 hours, day/month/year, month/day/year and year/month/day formats. The display can also be dimmed – automatic dim times can also be defined. Also, another good option is to set DST rules – though it might get a little bit tricky to master. The alarm volume can also be changed. GPS settings are the normal ones we can find on other clocks, like setting the baud-rate, GMT hour and minute difference and some GPS debug options to troubleshoot GPS problems. To compile the code, it requires the necessary WireRTC control library, that’s also available in the standard Arduino distribution. The code shows many available options and it’s quite big, but it seems easy to read and understand. Some of the extra options, like the pressure and humidity are undocumented, only existing on the source code – no wiring or parts are described on the documentation. Presumably these are for future expansion. Before my final thoughts, I’d like to point out that there are some areas that require some improvement. The documentation on the site, though mostly complete, requires some clean-up and the removal of some ambiguities, like references to parts that don’t exist anymore. It’s clear that improvements are being added both to the hardware and the software and those are not reflected in documentation, making it sometimes a little bit frustrating. Akafugu acknowledged those problems and is currently fixing them up. Some of the clean-up is already in place when this review was published. One of the main “faults” I’d like to point out is a missing complete table that includes all the menus of the device and a matrix with each shield features. I’m sure this would help many buyers deciding. Another page that requires some cleaning is the Resources page. A clear place where to find schematics, manuals and links to the software would be something that would make the experience less frustrating. Though the clock schematic is available, I couldn’t find the shields schematics - they might be important when troubleshooting tube problems, because the way each shield is driven is considerably different from the others. On the clock software, I’ve noticed that some features work sporadically, like the Four-Letter Word display – sometimes the tubes are just blank. I’m not sure if this is an issue of a specific shield, but usually a restart of the clock solves this issue. Akafugu suggested to check if the EEPROM chip connections or adding a decoupling cap, but since I started this review, the problem did not happen again. The device is very well made – it clear that it has already some years of development and fine-tuning. 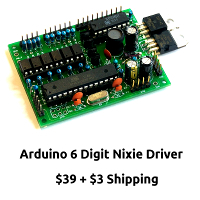 The fact that the source code is available, makes this device very desirable for hacking, customization and general learning on how to make a Nixie or a VFD clock. Assembling the kit is relatively easy once some of the ambiguities of the documentation are solved. The hole with groves method of assembling wire tubes is very useful! It’s a pretty device and an excellent use of several VFD tubes. Communication with Akafugu has always been excellent – Per Johan Groland has been very communicative and ready to help with any questions asked. I’d recommend this device for all those that like VFDs, a small beautiful clock or a piece of hardware you can also hack and play with. It sure is one of my favourite VFD clocks so far! That does look like a good clock.